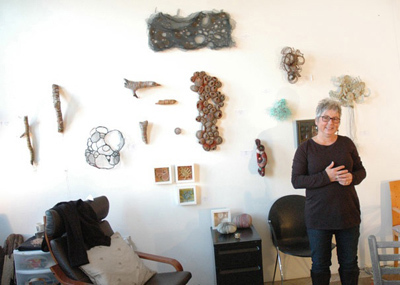 Artist Jodi Colella‘s nimble mind and nimble fingers have produced an array of compelling sculptures. It’s our good fortune that she’s got a show coming up at NK Gallery in June. 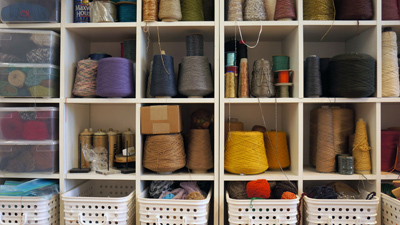 Let’s take a look into her studio and learn about her working process. 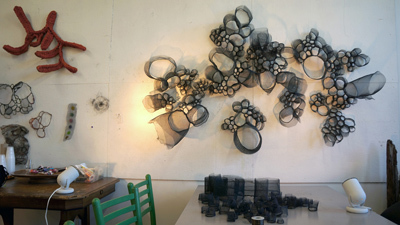 I create 3D objects as abstractions of natural forms. 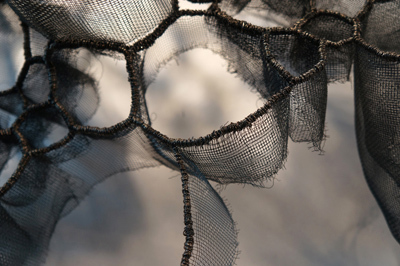 Using found and manufactured materials I explore the characteristics to transform them into unexpected forms. 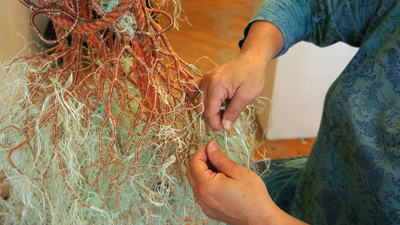 I combine a methodical and meditative work practice with simple traditional handwork techniques like crochet, knitting and felting that then evolve into other directions. Science informs my designs. 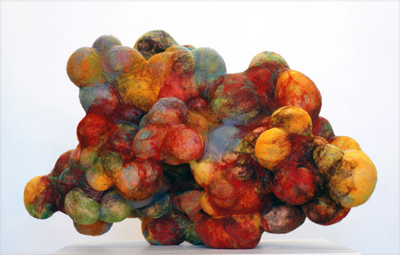 The organic forms reference both the macro and microscopic – exaggerated cellular forms that act as metaphors for the human condition. I’m in awe of the elegance of the mechanisms of life and the adaptations of biological systems. The act of making is time consuming and repetitive, echoing the incremental growth and accumulations that happen in nature. I often engage my community in the processing of my pieces. HIVE is a public participatory project that has been developing over the past couple of months as part of my interest in the chemistry that happens between makers when they work together. 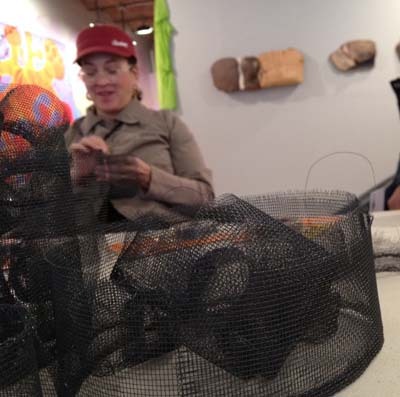 During regular meetings with several different groups of participants, units of screen chambers are fabricated then assembled into the collective composition of the HIVE. The materials of aluminum screen and steel wire, combined with the technique of simple wrapping, are free of traditional associations. What remains is the experience of working together, where strangers transform into friends with occupied hands, a free consciousness and relaxed environment for sharing. The HIVE sculpture will grow organically as a materialization of time spent together. 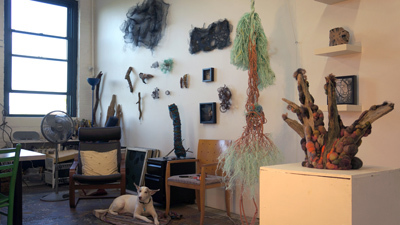 Other sculptures include the Dendrite Series, found fishing ropes that morph into nerve endings; the Marrow Series, wool growing from the core spaces of driftwood; and large felted orbs representing growth. I operate my studio like a laboratory where the beginnings of many experiments with material and process are lying on every surface. I start with play and let the dialogue between me and the material direct us through the process. My ultimate goal is to engage – to create a physical attraction that beckons the viewer to touch and BE touched by what they see. Image credit: All images courtesy of Jodi Colella.